This week’s chart is one a few people have asked for, a rabbit. Once again I am going to lacesockslupins for a picture of the chart knit up. 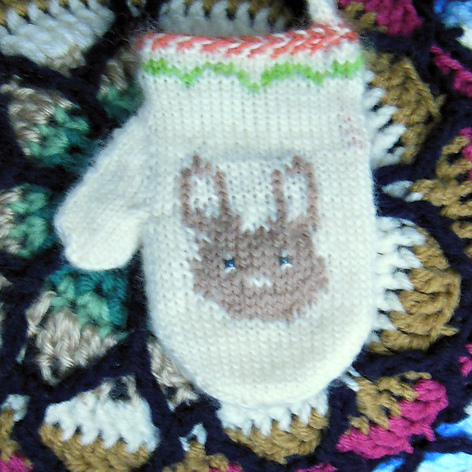 (She did it on a mitten instead of the sweater.) Aren’t the eyes cute done with beads? 6 months ago by Kat in Knitting , Knitting Projects , Knitting Socials , Needlecraft , Projects , Socials | You can follow any responses to this entry through the RSS feed. You can leave a response, or trackback from your own site. What about a chart for a howling wolf? That would be super cute!